To Support Us On Patreon: Click Here. Today we talk about Routines- but as usual Mary and Chris may go off on a few tangents and also talk about trade shows, balance when dieting, and even a bit of potty humor! Mary and Chris offer invaluable insights and suggestions to get your business up and running. Mary and Chris discuss why website security is a must as well as all goings on at APF. I believe we just coined the term "Convention Hangover." You're welcome. Trials and tribulations of keeping a healthy weight and Pooh Bear makes an unexpected appearance. Chris likes Weight Watchers and Mary likes Noom. Mary and Chris discuss how as professionals we convey that to our clients. Chris recommends Tarte, Smashbox, Urban Decay, and Kat Von D. Mary’s potato pancake recipe is: peel and grate 3 large potatoes and one onion, add in black pepper, one egg, and enough flour to keep it together. Fry as a pancake in olive oil. We talk about when &$%! hits the fan! 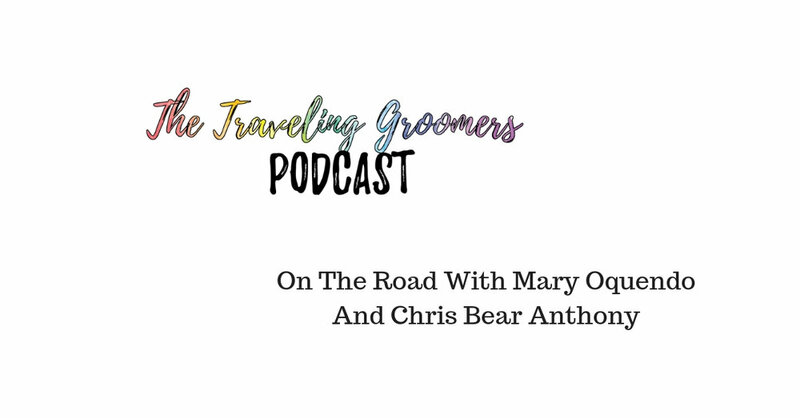 (NOTE: There are squeaky toy sound effects in this episode) Funny stories/antidotes of Chris and Mary’s tales of grooming on the road! Mary and Chris discuss moving your mobile and house call grooming business. We are joined by our special guest and sound editor extraordinaire, Laura Civello Hearn. Let’s discuss setting boundaries with our clients and protecting ourselves from clients. Groomers are a diverse bunch. We all find our way by different routes. Mary and Chris discuss how they got started in the pet industry, as well as their start on the road. The Groom Pod Discussion Group, Shampoos And The Grooming Industry, and that wonderful thermos.